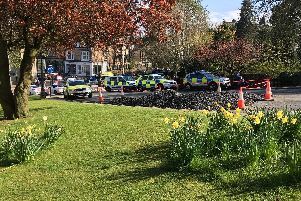 The number of people caught with guns and knives in North Yorkshire has increased by more than a third, according to the latest police recorded crime statistics. There were 215 weapons possession offences in the 12 months to September 2018, according to data by the Office for National Statistics. These can include hand guns, knives and even corrosive acid. That figure is up 40 per-cent on 2016-17, when 154 incidents were recorded. Overall, police recorded crime in North Yorkshire increased in the 12 months to September 2018. Over the period, 29,700 crimes were recorded, up by 14 per cent on 2016-17. That means there was a rate of 49 crimes per 1,000 residents during 2017-18, below the England and Wales average of 85. There were 1,639 residential burglaries reported in North Yorkshire. Due to a change in how the ONS categorises burglaries, the localised figure cannot be compared with other years. There have been three homicides, which are murders or manslaughters. There were 25 cases of death or injury by dangerous driving. Theft, one of the most high volume crimes, increased by 8 per cent. Drugs related offences rose by 6 per cent. Criminal damage in North Yorkshire, which includes arson and vandalising cars and houses, has gone up, from 4,335 incidents in 2016-17, to 4,343 in the latest figures. In North Yorkshire, there were 1,337 incidents recorded between October 2017 and September 2018, a 27 per cent rise on the previous year, when 1,052 crimes were reported. There were also 1,700 cases of stalking and harassment reported over the same period.